Hunt's cohorts told police the woman hurled racial epithets at them. 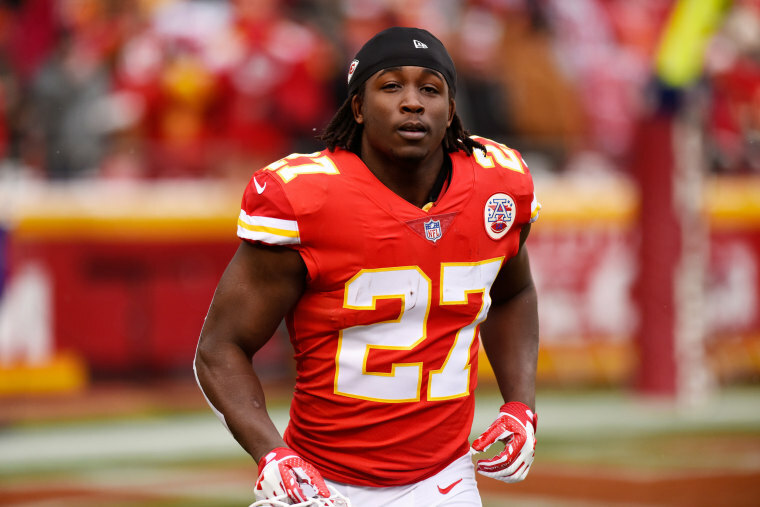 Kansas City Chiefs running back Kareem Hunt was suspended by the NFL and then cut by his team after surveillance video surfaced Friday that shows him kicking a woman he had just pushed to the ground. Hunt, who had the fifth most rushing yards in the NFL this year, got into an argument with a woman at The Metropolitan hotel in Cleveland, in the early morning of Feb. 10, TMZ Sports reported. The video has no audio but shows a clearly heated confrontation, in which Hunt pushes one of his friends into a woman in a blue dress and they both fall to the ground. The dazed woman — she appeared to have hit her head on the wall — gets up for a moment and then crouches down again when Hunt kicks her backside, knocking her over, the footage shows. Hours after the video surfaced, the Chiefs cut Hunt, who led the league in rushing yards last season as a rookie. Chiefs officials said they learned of the February incident earlier this year, and the NFL and law enforcement launched an investigation, and several members of the Chiefs' team spoke directly to Hunt. The Chiefs' move came less than 30 minutes after the NFL announced that Hunt was being suspended. "The NFL has placed Kareem Hunt of the Kansas City Chiefs on the Commissioner Exempt list, and as a result, he may not practice, play or attend games," the NFL said in a statement. "The NFL's investigation, which began immediately following the incident in February, will include a review of the new information that was made public today." Hunt issued a statement late Friday. In police body camera video obtained by TMZ, the woman did not appear to know Hunt's last name or that he was a pro football player. “Kareem ... I just met him today, the person who assaulted me," she said, clearly distraught. "He shoved me, he pushed me. You can watch the video tape which I would like to see if that’s possible." Also in the TMZ video, a friend of Hunt's told police that their group had met the woman and her friend earlier at a club, but Hunt's group asked the women to go home when the women revealed they were only 19 years old. Hunt's friend said the situation turned heated when the woman tried to get back into Hunt's room. The TMZ report did not name the victim, but Cleveland police in February released officers' reports and a 911 call naming a Kent State student who had accused Hunt of roughing her up at The Metropolitan on Feb. 10. NBC News is not identifying the woman in the report. In the police report, Hunt’s friends accused the woman, who appears to be white, of using "the N-word" while she said the men had promised her and her friend a ride back home to Kent State. “The pushing and shoving caused abrasions on her left knee, right hand and a scratch on her chest,” according to the responding officer. Hunt told police he insisted that the woman and her friend leave his apartment because they were just 19 at the time, according to the February report. "[The woman's friend] started calling him names and he did not want any part of it," an officer wrote. The police reports did not mention the kick captured on surveillance video. The footage drew comparisons to former Baltimore Ravens running back Ray Rice, who was caught on surveillance tape in 2014 punching his then fiance and now wife, Janay Palmer, in an Atlantic City hotel elevator. Rice was released by the Ravens after the video came out and never played in the NFL again. Meanwhile, former Chiefs running back Larry Johnson, who was cut by the team for making gay slurs and has multiple times arrests for domestic violence, said Friday that Hunt should know better. "I thought by speaking aloud about my pitfalls that players after me could see these situations before they’d happen," Johnson tweeted. "REALLY F---ING UPSET KAREEM......"